. Published on Wednesday, August 1, 2018 . As college students, we have a regular schedule that revolves around school and work. We know that it can be tough to juggle your school life with your work life, which is why we here at The Campus Crop recommend finding something to do that separates you from your busy workload. We recommend a hobby, and we know the perfect hobby to embrace: rock climbing. Are you thinking, “no way am I climbing that wall?” Before you say “no,” hear us out, because the next thing you know, you’ll be adding it into your daily routine! Something that many of us have gotten into and even made time to put into our busy schedules is working out. Working out and going to the gym is so common nowadays that it’s almost impossible to find an empty gym. Tired of your same workout plan? 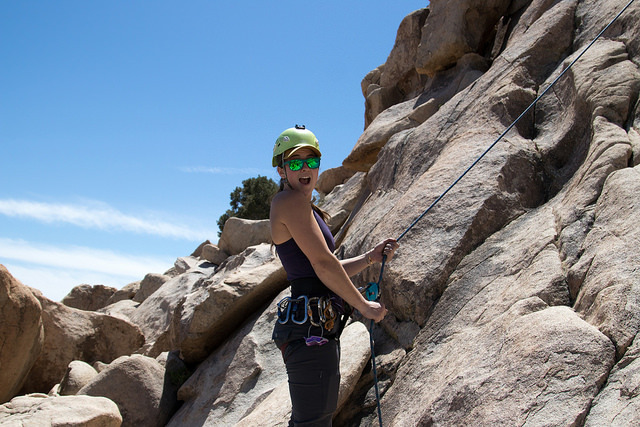 With rock climbing, you have a variety of routes to choose from, which can always be a new experience. And the best part is that it’s a full body workout! Relive your childhood memories as you climb, or play, on the wall. You’ll be having so much fun that you’ll forget that you’re actually working out. No more forcing yourself to go workout because you won’t be able to wait ’til you get back and finish that climbing route! You can meet tons of people simply by climbing. Work together with others to figure out the route that you’ve been working on. Even if you don’t get it right away, you’re sure to have people cheering you on and offering you advice when needed. And if you want to meet more people through climbing, you can join clubs at your local climbing gym or even here at Cal Poly Pomona (CPP). The Bronco Ascenders are a Sport Club with ASI Campus Recreation that practice climbing together and even go on trips to showcase what they’ve learned. If you love the rush you get from competing, then this sport is for you. Every time you climb, you compete against yourself and the wall to make it to the top. Climbing with this idea will help you get better at it too. You can literally see your improvement with each inch that you get higher on that wall. You can showcase your skills in a variety of competitions such as bouldering, leadand speed climbing. Probably the biggest competition that we’re looking forward to seeing in the future is at the Olympics in 2020. For the first time, athletes get the chance to take home a medal in climbing. Start climbing now and maybe we’ll see you there! Thinking about giving the sport a try, but don’t know where to go? You’re in luck because students that are enrolled in classes are allowed access the BRIC’s Bronco Peak for free. To start your career as a climber at the BRIC (Bldg. 42), you will need to take the two-hour orientation when the BRIC’s Bronco Peak opens. All you need to do is speak to an Outdoor Adventures attendant and let them know you want to take the orientation. Don’t want to commit yet? You can Try A Climb and let an attendant know that you’d like to climb just one route to get a feel for it. For more about climbing at the BRIC, check out all the information here. In case you’re curious about other places to climb, there are a variety of places nearby as well. How did you like rock climbing? Let us know by using the hashtag #CampusCropChat on Facebook, Twitter and Instagram, and don’t forget to follow us on Snapchat @asicpp!